Bamboozlement is a term suggested by Greg Frederickson to describe plane dissections, followed by rearrangment of pieces that result in a figure of supposedly different area. This is Martin Gardner's modified version of Curry's paradox. An extensive history and explanations are given in [Martin Gardner, 1956]. See also [Frederickson, 1997]. The picture made Daniel Takacs. Sam Loyd presented this fallacy one the first American Chess congress 1858. The first time this was seen in print was (1868), a "Kurze Mitteilung" of the Editor O. Schlömilch. Eleven years later (1879) Schlegel published the Fibonacci generalization. Alex Bogomolny made an applet Fibonacci Bamboozlement where you can shift the pieces for squares of Fibonacci number size. Given three numbers x0, x1, x2 in almost geometric progression which means that x1 x1 - x2 x0 = µ is small. The following figure shows half of a x1 by x2 + x1 rectangle. Rearranging the four pieces gives a x0 + x1 by x2 rectangle. The area difference between the first and the second rectangle is µ. The classical parameters given by Sam Loyd are (x0, x1, x2, µ) = (3, 5, 8, 1), three consecutive Fibonacci numbers, in which case one rectangle is a square as x0 + x1 = x2. Other transformations are given in the table below. Typically you find the note that this transformation can be made for arbitrary rectangles A*D and B*C if |A*D - B*C| = 1. But this is not true. [Lietzmann 1972] and [Devendran 1985] correctly say that we must have A+B=D in addition. I think my parametrization is more suitable for this dissection. Given three numbers x0, x1, x2 in almost geometric progression which means that x1 x1 - x2 x0 = µ is small. The following figure shows half of a x1 by x2 + 2x1 rectangle. Rearranging the six pieces gives a 2x0 + x1 by x2 rectangle. The area difference between the first and the second rectangle is 2µ. This construction can be generalized. So we have an 8 piece transformation of a x1 by x2 + 3x1 rectangle into a 3x0 + x1 by x2 rectangle where the difference of their areas is 3µ. Many Bamboozlements use Fibonacci numbers. One of the oldest theorems about Fibonacci numbers, due to the French astronomer Jean-Dominique Cassini in 1680, is the identity Fn+1 × Fn-1 - Fn × Fn = (-1)n. The shortest proof of this identity is via the matrix identity which is another way of writing the recurrence formular. Then use the theorem that the determinant is multiplicative. Fn+1 × Fn-1 - Fn × Fn = - (Fn × Fn-2 - Fn-1 × Fn-1). Showing the relation for n=1 with F2 = F1 = 1 and F0 = 0 completes the proof. A combinatorial interpretation of the relation of Cassini was published by N. Werman and D. Zeilberger. The hole need not be in the middle but this looks nicer. A parallelogram is dissected by a diagonal into to congruent triangles. Select a point E on the diagonal. Draw lines through E which are parallel to the sides of the parallelogram. As a result we get four small parallelograms. Now Euclid says: The two supplement parallelograms DGHE and BEFC have the same area. If E is not on the diagonal then we have two quadrangles AGIE and ACIE. And area(AGIE) - area(ACIE) = area(DGHE) - area(BEFC) but this is not null. This explains the paradoxes. The 'traingles' are quadrangles. What is the area of a parallelogram generated by two vectors X=(a,b) and Y=(c,d)? The corners of the parallelogram are 0, X, Y, and X+Y. Now assume that a, b, c, and d are positive. Our 'paradox' shows that the area is |a*d - b*c| the determinant of the vectors X and Y. The angle t between X and Y is t = arctan(b/a) - arctan(d/c). Using the scalar product we get the equations |X|*|Y|*sin(t) = Area and |X|*|Y|*cos(t) = X*Y. Division gives tan(t) = Area/(X*Y). Substitute the parameter of the chess board dissection gives X=(8,3), Y=(5,2). Then the area=1 and X*Y=46. So t = arctan(1/46) which is nearly 1/46. This follows from the alternating series arctan(x) = x - x3/3 + x5/5 - ... . Converting Rad to Degree gives 1.245 which is rather small. Über einen geometrischen Trugschluß, Mathematisch-Naturwissenschaftliche Blätter 13 (1916) 89. The Lewis Carroll Picture Book, T. Fisher Unwin, 1899. (continued fraction convergents A/B and C/D with the constraint A+B=D) Shows Schubert's 7/24 to 9/31 example. Chaper 16.Addendum: Jigsaw Paradoxes, 128-130. (german: Mathematik und Magie, DuMont, 1981 Tb 106, ISBN 3-7701-1048-X and Mathemagische Tricks, Vieweg 1981) Capter 8: Geometrical Vanishing Parts II, Best extensive discussion of the subject and its history. Concrete Mathematics, Addison Wessley, Reading, 1994, 2nd Ed. swedish page www.fof.se/main/hjarnbruk/ showing some dissections found in Martin Gardner MM&M . pp. 286-287: Recreation CVI _ The geometric money. first russion edition is from 1908. Fibonacci Quarterly 41 (2003) B-960, pg 182. 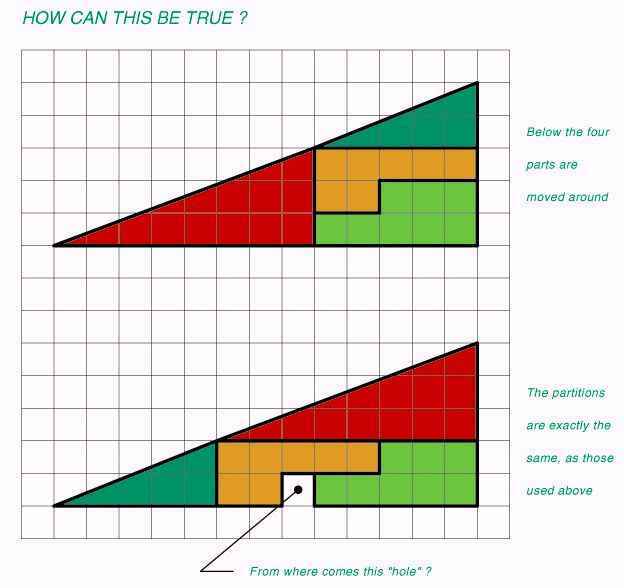 - The same puzzle but losing a square or How to Prove 64=63!! - Yet another Fibonacci Jigsaw Puzzle! - general case b*c and a*d rectangles with the constraints d=a+b and |b*c-a*d| = 1. - He writes that he invented this dissection and presented it one the first American Chess congress 1858. Verallgemeinerung eines geometrischen Paradoxons. Zeitschrift für Mathematik und Physik 24 (1879) 123-128 & Plate I. - 8 x 8 to 5 x 13 and generalizations. - Describes unpublished work in which Carroll obtained (in some way) the generalizations of the 8 x 8 to 5 x 13 in about 1890-1893. Cassini's Fibonacci identity is Fn+1 × Fn-1 - Fn × Fn = (-1)n.
A Scrap-Book of Elementary Mathematics. Open Court, 1908. A Faulty Dissection: What Is Wrong? and its solution Fibonacci Bamboozlement - an applet showing an 4 piece dissection using the relation Fn × Fn - Fn-1 × Fn+1 = (-1)n+1 where Fn is the n-th Fibonacci number. Curry's Paradox: How Is It Possible? - an applet for Curry's Paradox, Cassini's Fibonacci identity. Eye Opener Series - an applet showing an 2 piece dissection using the relation n × n versus (n+1) × (n-1). Rätsel - 0021: Flächentreue Abbildung? GEOMETREX. Incredible Puzzles create a simple way to learn the natural sequences of numbers, as well as, the Fibonacci and Lucas sequences. The sequences of natural numbers and related sequences have astonishing properties, which can be used in architecture or for creating paradoxical puzzles. This is the tangram paradox of [Gianni A. Sarcone].